HOUSTON -- It's a day earlier than planned but it's official! Dandelion is retiring from the colorful world of Crayola. Crayola planned to make the announcement revealing the retiring color in Times Square on Friday morning, but circumstances led them to make an early retirement announcement on Twitter. 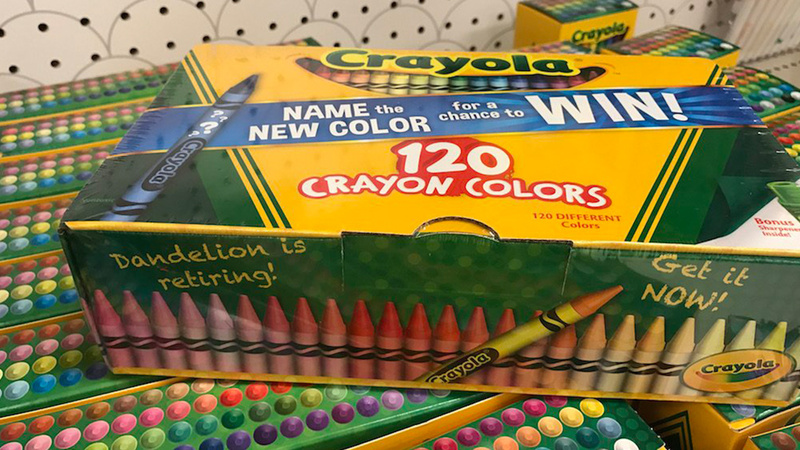 The box that spoiled the Crayola retirement announcement was captured in a photo taken by Laura Hegyi at a Target store in Marlton, New Jersey. Her son posted the photo on Twitter. Crayola had originally timed the retirement announcement with National Crayon Day, which is Friday, but seemed to take the spoiled in stride. "There has been a lot of buzz and excitement around which color we'd be retiring, and Dandelion was so excited to announce his retirement he snuck a few packages out of the factory and onto the shelves last night," said Joshua Kroo, Director, Marketing Communications & Virtual Creativity Platform. "One lucky fan came across the box and couldn't wait to share the news with the world, and neither could we!" Crayola will not produce any more crayons in the dandelion share. Only boxes still on the shelves (or waiting to be put on shelves) will contain dandelion crayons. Dandelion has been part of the Crayola collection since 1990. The color was added to the 24-count box in 1999. Dandelion is not the first to be removed from the 24-count box, but it is the first to be completely retired from all Crayola boxes. The crayon's replacement will be announced Friday morning in Times Square.